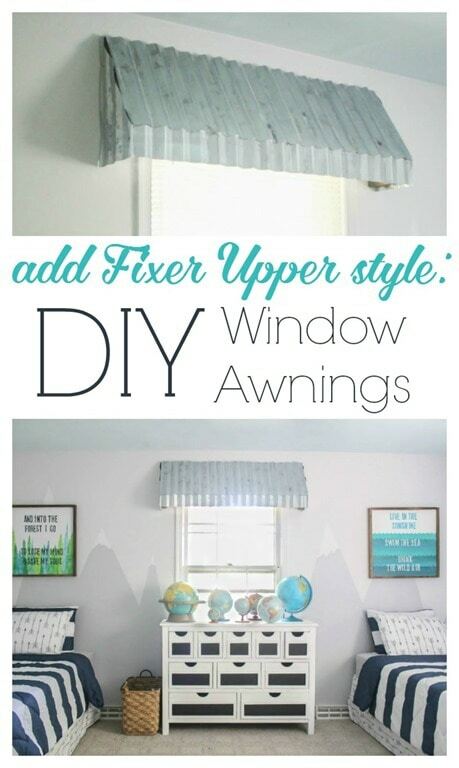 How to make gorgeous farmhouse window awnings - Lovely Etc. 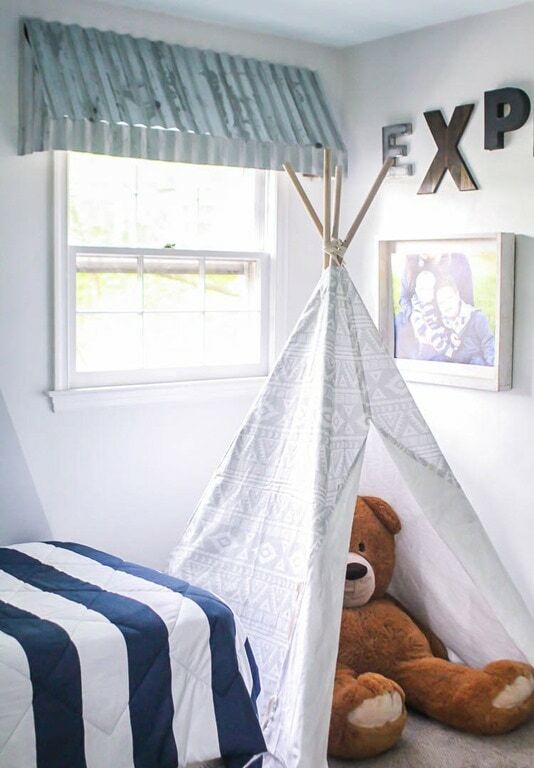 One of my absolute favorite parts of my sons’ bedroom makeover is the rustic farmhouse window awnings. I love the farmhouse vibe they add and I think they would look pretty amazing in just about any room in the house. Generally I’m a huge fan of long curtains in every room, but I wanted something a bit different in this room. I went searching for inspiration and found the perfect thing. 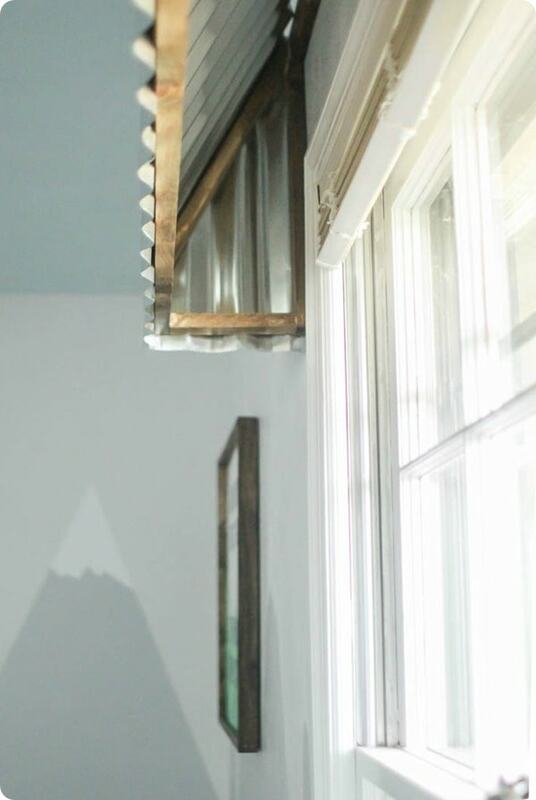 When I saw this photo of similar farmhouse style window awnings in Joanna Gaines’ farmhouse, I knew I’d found a winner. The only problem was figuring out how to make them for myself! Luckily, I don’t give up easily so I got to work figuring out exactly how to design and build my own version. Now I have two gorgeous farmhouse window awnings and of course I have a full tutorial to share with you guys. These rustic window awnings really aren’t difficult to make and they are incredibly cheap at only $40 per awning. But fair warning, there are quite a few steps involved so this one may take a few days from start to finish. 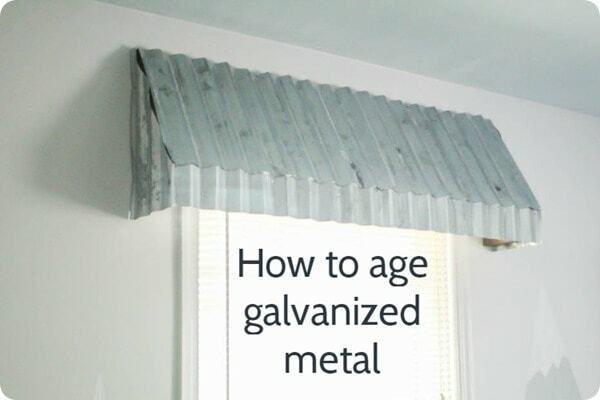 Okay, so now that your corrugated meal is all weathered and aged to perfection, it’s time to build some awnings! The basic structure of these awnings is a simple wood frame that is then covered in the aged metal. 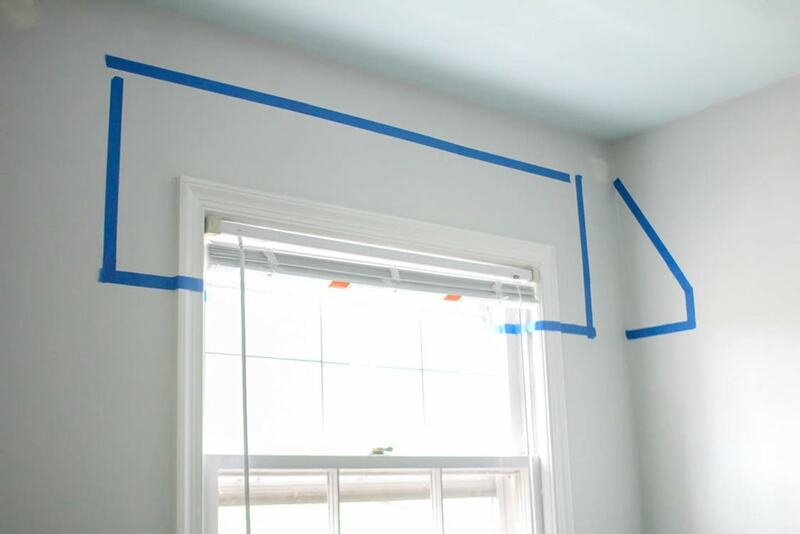 To figure out exactly how big my awnings should be, I used painter’s tape to mark off where the awnings will go around the windows in my room. I made a few adjustments and then simply measured my painter’s tape to get my measurements for my wood. My windows are pretty standard size, but if yours are larger or smaller, you can easily adjust my measurements to fit your own windows. My awnings go 5 inches past the window frame on each side, so simply add 10 inches to the width of your window. You can also make your awnings taller if you would like; but keep in mind that the more of your actual window you cover, the more light you will block. I chose to make my awnings cover just enough of the window to hide the blinds underneath. 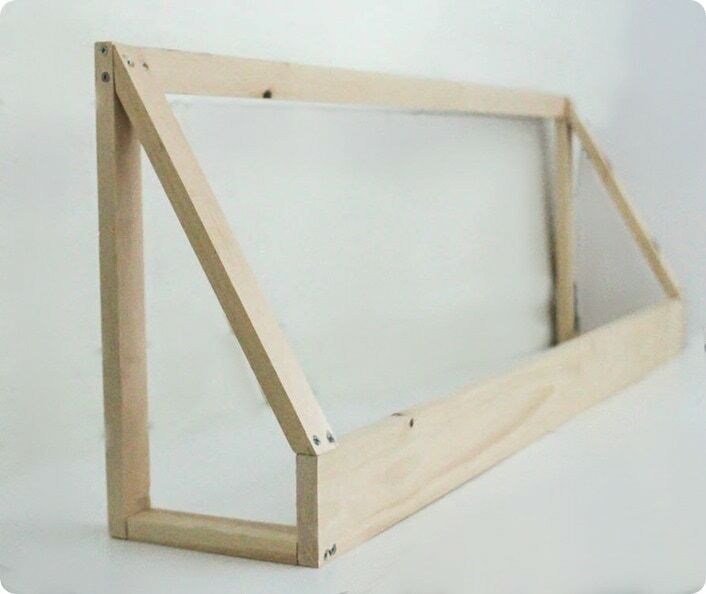 The wood frame for the window awnings is made from inexpensive pine boards. 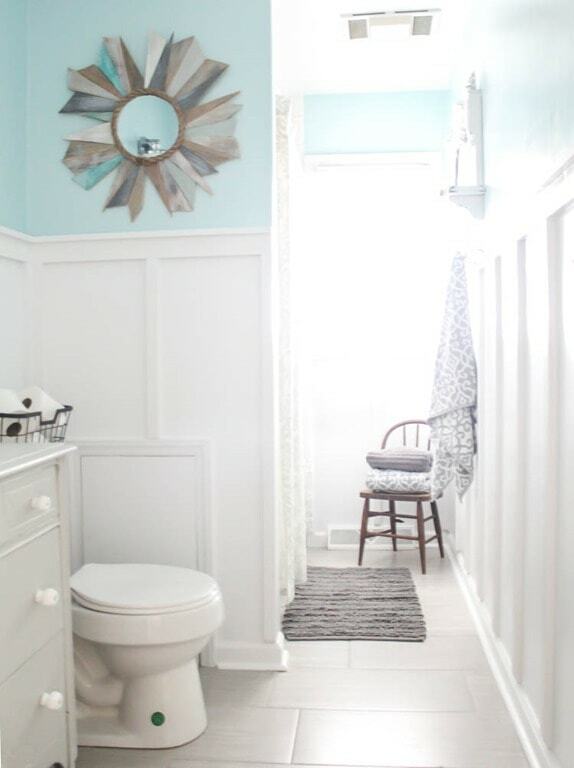 The frame won’t show much so you really don’t need to use fancy wood. For each of my window awnings, I used 1 1×4 pine board and 2 six foot long 1×2 boards. 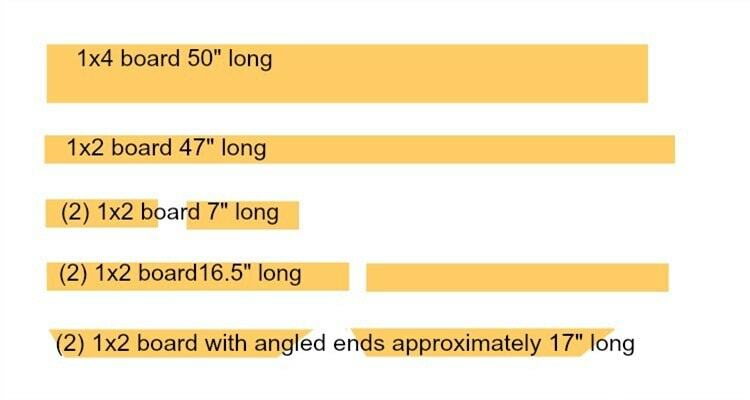 The diagram below shows what cuts of wood you need for each awning. Just remember to adjust your measurements if your window is a different size than mine. Also, notice the final two angled pieces have approximate measurements. I recommend you do these tricky angle cuts last to avoid mistakes. Once you have all of your straight cuts done, you are ready to begin to assemble your window awning frames. Putting these together is pretty straight forward. I predrilled my holes and used simple 1 1/4 inch wood screws to attach everything. First attach the 7 inch pieces to the ends of the 1×4. Attach the16.5” inch pieces to the backs of the 7 inch pieces. At this point, you can cut your angled pieces. I’m sure there is a mathematical method of figuring out exactly what angles your board edges need to be, but that isn’t really my strength. Instead, I simply held each board up next to the frame and used a pencil to mark where they needed to be cut. (My husband helped me with this because you do need more than two hands.) Then I used a jigsaw to cut the lines I marked. 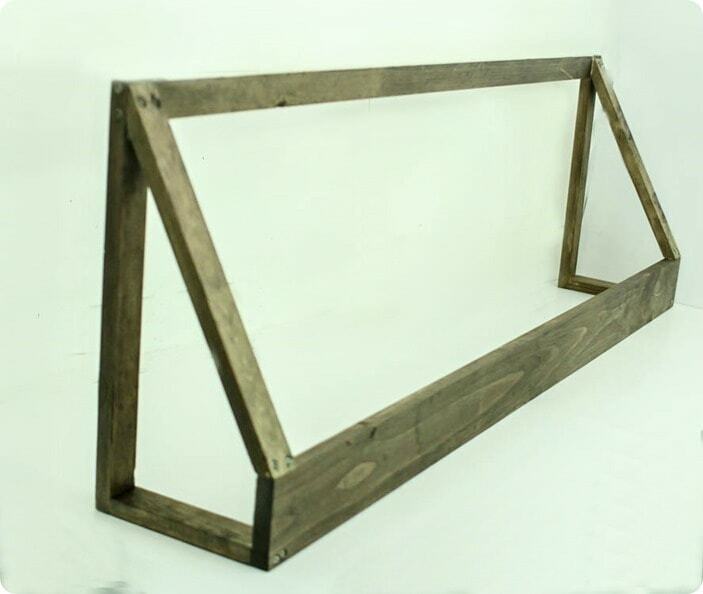 Then you can simply attach your angled boards to the frame as shown in the photo below. Last step is to attach the final 47” support board across the back. 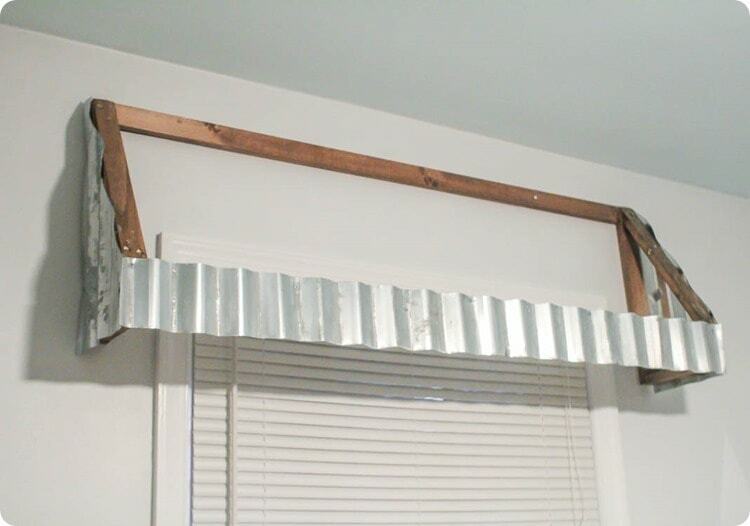 And that completes the wood frame for your awning. 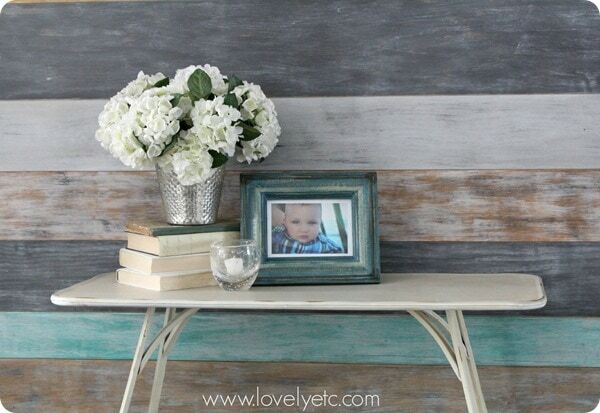 Once the frame is built, you can stain it with your favorite wood stain. I used Minwax dark walnut stain. Even though the wood frame will be completely covered in metal, you will still be able to see it if you are standing directly below the window. The dark stain gives it a great rustic look that compliments the aged metal. 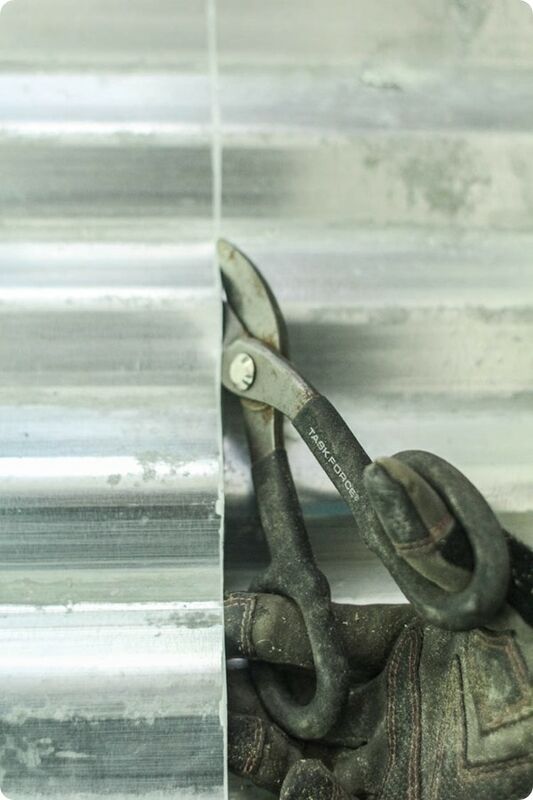 Cutting your big sheet of metal roofing is really simple. 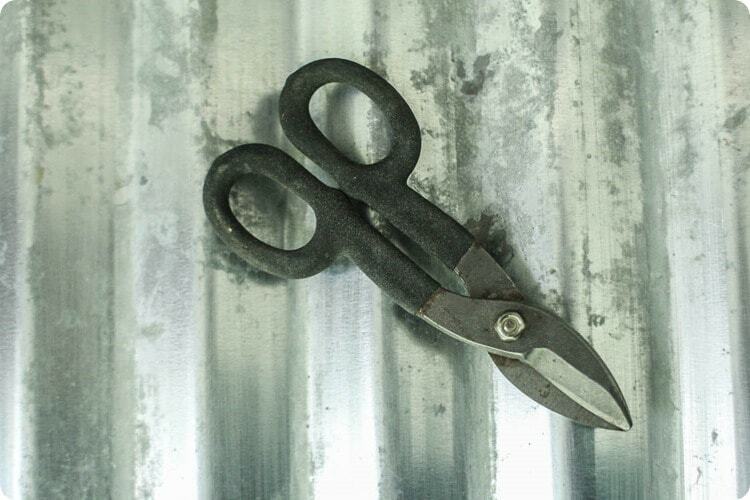 All you really need is a pair of tin snips – basically scissors that are sharp enough to cut metal. These are the measurements I used. Of course, if your awning is a different size, yours will be slightly different. For the two sides, I simply traced my wood frame onto the metal so I could be sure to get the angles right. Once your pieces are cut, hold them up to your frame to make sure everything looks right. You can always trim a little more off with your tin snips if needed. Use metal screws to attach the metal to the wood frame. It is easiest to go ahead and screw all of the metal to the awning frame before installing the awnings above the windows. To install them, you will have to remove the largest front metal panels, but the extra step is worth it. It is so much easier to reattach those two metal panels at the end with all of the holes for the screws already in place. You can leave the sides and the lower edge of metal on the frame for installing. And finally, we can hang those bad boys! Use a stud finder and mark where the studs are above your window. You might want to have a helper to help hold these in place while you install them. (Hubby helped me with this part.) Make sure that they are centered over the window and level before attaching them. Then you just need to screw the wood frame into the studs. We also added a screw in each side of the awning to make sure everything was extra secure. Then I quickly reattached the other two metal panels and gave a little cheer because they were finally finished! The view from underneath. In case you were curious. These window awnings took more time to make than most of my DIY endeavors, but they were so worth it. I absolutely love them. 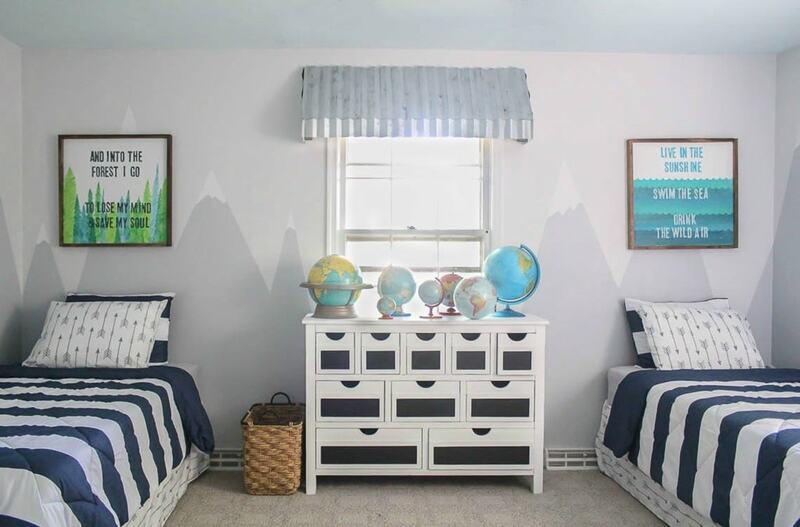 They are perfect in my boys’ room and I know they would look just as fabulous in almost any other room in our house. Love, love, love them! What do you think? Do you have the perfect spot for some rustic window awnings in your home? 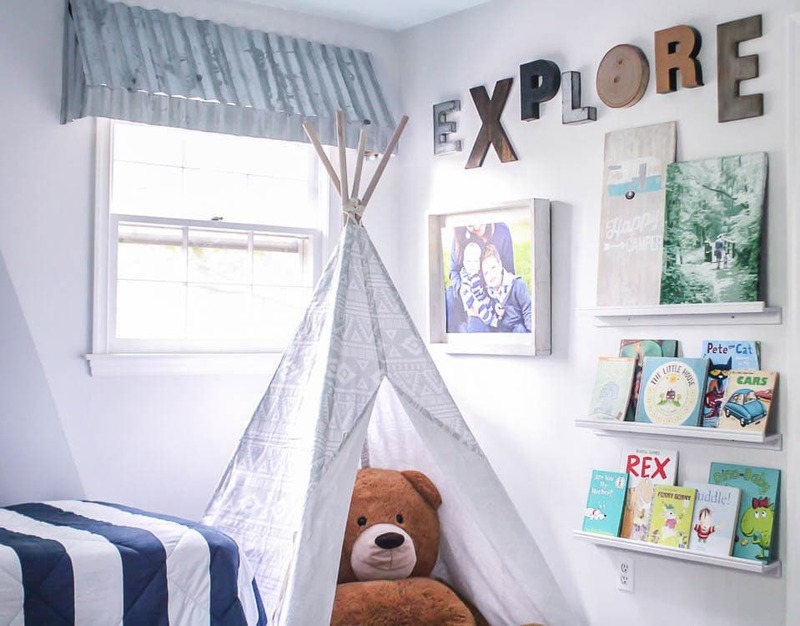 And if you missed it, you are definitely going to want to see all of the details of my budget Modern Farmhouse Boys’ Bedroom Makeover. Wow! The windows look so beautiful and it is so easy to make. Will surely try this out soon. Thanks for sharing. These really are my favorite element of the room! Wow! Thanks for the tutorial! Did you do anything to the edges to smooth them? I always seem to end up with sharp uneven edges when cutting tin. Can you tell me how heavy you think these are? I have a triple window and would like to do one that covers all three. I woory about the weight on my walls though ….what are your ideas? Jenn, because the wood frame is very thin, they aren’t very heavy, maybe 5-10 pounds each? I have definitely hung mirrors on our walls that are significantly heavier than these awnings. I’m not a professional, so this isn’t professional advice ;) but I think they would probably be fine as long as you secure them to several studs. Thank you Linda! 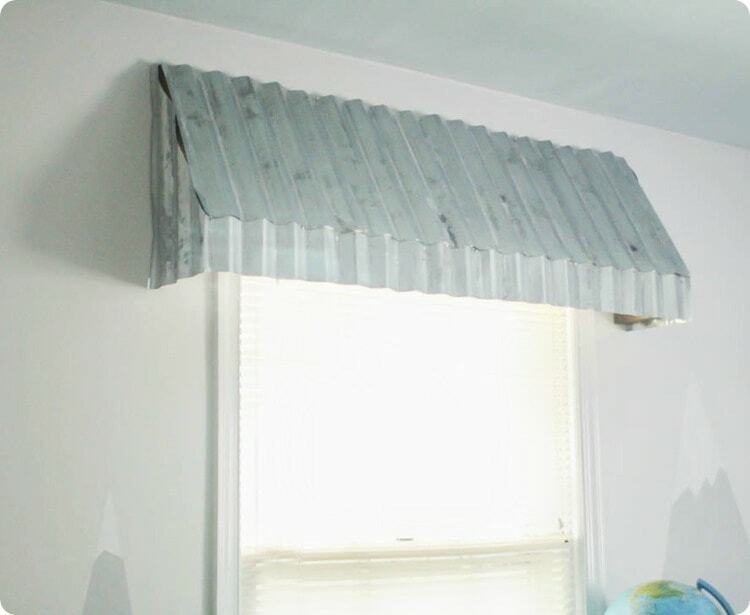 This would be awesome for your craft room but you’re right, cutting tin isn’t impossible, but it definitely isn’t easy!